I like books about improving your life, but I wouldn’t say I read self-help books precisely—I read ones that have more analysis to them, exploring, say, how habits function, which will inevitably lead to advice on how to form better habits. 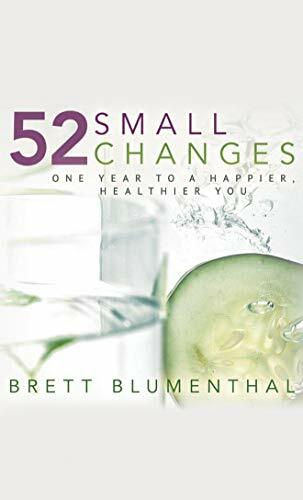 That book, Gretchen Rubin’s Better than Before, included in its suggested reading section (mostly a gold mine, by the way) 52 Small Changes: One Year to a Healthier, Happier You by Brett Blumenthal. It sounded like it could have interesting advice—but maybe the title should have tipped me off that it was a little too far into the self-help genre for my taste. It was not a bad book by any means, and I still think the concept is good: 52 positive changes, intended to be undertaken one per week. The trouble was the specific changes, and the (lack of) detail on carrying them out. I wanted clever, unusual suggestions, preferably ones that can be undertaken easily for an outsized result. Sounds ideal, I know, but for example: many people tell Rubin that forming a habit to make their bed every morning makes them much happier. 52 Small Changes is not those kinds of suggestions. The suggestions were simultaneously too obvious and too ambitious. I don’t need a book to tell me that I should eat more vegetables. I’m decently good at that anyway, but more importantly—the entire world has already told us that we should eat more vegetables. I don’t think there are many adult (or child) Americans who haven’t been told that more vegetables would be healthy. How to make it happen is the challenge, and Blumenthal doesn’t have much to say on the subject. That’s kind of the pattern of the whole book. Something fairly common sense is suggested, with a little justification for why it’s good for you and very little advice on how to implement. Just go ahead and do it: sleep 7-8 hours every night, fit four hours of various types of exercise into your week, vacuum every two days, and cook all fresh food, preferably vegetables and lean protein, instead of eating processed. You have time for all that, right? Those would be small changes, yes? Of course it’s all things we likely should do—but Blumenthal doesn’t offer much in the way of new ideas, or new tips on how to implement old ideas that people often spend years struggling with. If it was easy to sleep enough, exercise enough, and eat lots of veg, we’d all be doing it already. For most people, those are big changes, not small ones. I did buy an air filter based on this book’s advice; that was legitimately a small change and, if it turns out great, will be worth the whole read. But I still wouldn’t really recommend this book. It could be worthwhile for structure if you know you want to implement some changes and are willing to do more in depth research for implementation ideas on the side…but you’re going to have to put a lot more into it than this book suggests. Launch Day! The Lioness and the Spellspinners Is Out! Sounds like the premise of 52 changes would be difficult right out the gate since they would, by definition, have to build on themselves. That’s a lot of change to incorporate if you’re going to try more than a few of them. And some are probably, like you said, contradictory, so that’s a problem since there is only so much time in a day. You wonder if authors consider these things when they write books like this. It seems this author didn’t.